The British Government's decisions on naval strategy and policy were made by the Cabinet and carried out by the Admiralty. Nominally the Admiralty was headed by the Lord High Admiral, but the last man to fill this post was Prince George of Denmark in 1709, and afterwards it was headed by the seven "Lords Commissioners for Executing the Office of Lord High Admiral" - the Admiralty Board, whose senior member was the First Lord. He was usually a civilian, or occasionally an admiral, and a member of the Cabinet. The Admiralty was a Government department. The navy was the largest, most complex, and most expensive of the businesses of the Crown, and the Royal Dockyards were by far the largest industrial enterprise in the world. Click here for an organizational chart of the Admiralty. The Admiralty Office was in Whitehall, London. The First Lord lived there in a suite of apartments, and it had a staff of between fifty and sixty, headed by the First and Second Secretaries, who had great authority not only in carrying out the Board's instructions but also in initiating action. The Admiralty Library, and the departments for the Marines were there. Pay and conditions were very good. Clerks and officers tended to serve very long periods, and experience and devotion were highly rewarded. In consequence the Admiralty was very efficient by the standards of the day. It had one main board, the Navy Board, and was also responsible for the Marines, the Impress Service, and the Fencibles, as well for many different and often mutually hostile intelligence networks. The Admiralty commissioned the navy's ships with the money voted to it each year by Parliament. It decided the basic specification when ordering each one or each class before design work started, since it also determined the role and requirements of the new design. The Board usually expressed its wishes in terms of dimensions, tonnage, or the numbers and calibres of the guns on each deck. The Surveyors of the Navy in the Navy Board Office then designed the ships, and plans were supplied showing the ship's lines in 1:48 scale. The draughts showed the details of the decks, masts, hatchways, gunports, and so on, and the sweeps or curves used in determining the shape of the hull, but other fittings, decorations, and armament were not usually shown, since these were the choice of the dockyard or laid down in the Establishments. Once approved copies were sent to the dockyards or merchant builders. The Admiralty Board met every day - even Christmas. Its decisions directed the movements of ships, commissioned and promoted officers, and dealt with administrative matters. In times of war, the Admiralty increasingly became an operational command centre. 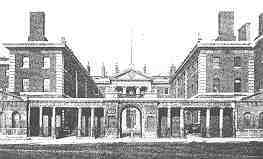 The Navy Board was located in the Somerset House complex on the Strand in London. The Board built and supplied the ships, ran the dockyards, purchased or manufactured all the navy's stores and equipment, appointed most and examined some of the warrant officers. It employed thousands of men. It antedated the Admiralty's foundation in 1628, often resented the Admiralty, and perpetually sought effective independence. Its ten members appointed by the Admiralty Board and usually holding their positions for life, were "The Principal Officers and Commissioners of the Navy." They were naval officers and civilians, often master shipwrights. Each dockyard commissioner also had a seat. Their head was the Controller of the Navy, always a senior naval officer. Click here for an organizational chart of the Navy Board. The Admiralty commissioned the ships, and the Navy Office produced the designs. Surveyors of the Navy, their assistant surveyors, and three or four draughtsmen designed from experience and from copying and modifying the lines of captured or observed ships, especially French ones. Once approved by the Navy Board and the Admiralty (usually a formality) the draughts were copied manually as many times as needed for the yards. If ships were to be built in private yards, it was the Navy Board's responsibility to invite tenders and negotiate contracts. The Navy Board had two subsidiary boards, the Victualling, and Sick and Hurt, with their members also appointed by the Admiralty Board. The Victualling Board appointed pursers and supplied the navy with food, drink and clothes using its own bakeries, breweries, and slaughterhouses, and supplied the naval bases. The Sick and Hurt Board examined surgeons, provided their supplies, and ran the hospitals, and during our timeline looked after and exchanged prisoners. The Ordnance Board, a separate department independent of the Admiralty, had offices in the Tower of London and at Woolwich. It tested, manufactured, developed, and supplied ordnance to both army and navy, and supplied gunners and their equipment to the navy. The Dockyards were run by the Navy Board, and were the largest industrial enterprise in the world. There were also around sixty private merchant yards, which built ships either to the Admiralty's design (supervised by a Royal dockyard foreman), to their own design hoping to sell it to the Admiralty, or as a merchant ship that the Admiralty bought and converted. It took about six months to build a sloop, two to three years for a two-decker, and several years for a First Rate. After the launch ceremony, the fitting out, or supplying of masts, rigging, sails, guns, boats, stores, and so on, could take several months more. The Royal yards also maintained and repaired ships. Among the Dockyard’s array of ships, those with no masts or guns and moored to buoys were "in ordinary," temporarily surplus to requirements, and manned by the standing officers, plus the purser and the cook. Other ships were guard ships for dock security, with about two-thirds of the crew and ready for action at a few days' notice; receiving ships, for impressed men waiting to be assigned to a ship; ships for prisoners of war; and sheer hulks, for stepping masts. The water was always full of boats for the yard's officers, yachts, longboats, yawls, wherries, gigs, cutters; buoy boats, hoys (for transporting stores), well boats, and the launches, pinnaces, skiffs, and other ships' boats. The master shipwright was the most important of the six principal officers. He oversaw the shipwrights and all the skilled trades that were not the master attendant's trades. Each of these trades had its own master, who in turn had foremen, quartermen, and labourers. The master attendant was a ship's Master, responsible for the ships in Ordinary, the navigation, pilotage, and buoyage and the masting and rigging of ships in commission. He commanded the warrant officers and labourers, and their superintending masters, and the master sailmaker and his foremen and labourers. The average Dockyard had shipwrights; sawyers; sailmakers; block makers and riggers; caulkers, oakum boys, and pitch heaters; bricklayers with labourers, masons, painters with labourers, and plumbers; house carpenters and joiners; and braziers, a cooper, founders, locksmiths, messengers, scavelmen (for cleaning the muck from slips and docks), smiths, teams, a tinman, warders, wheelwrights, and yard labourers (in the wood mills, in the metal mills, in the millwright's shop, and in the ropeyards). There would usually be trenail mooters, who made the ships' wooden nails. The navy had bases in Britain and abroad. They usually had stores, victualling, ordnance depots, and could repair ships afloat. Some had hospitals. A civilian representative of the Navy Board, the "naval officer", headed these bases. In American waters, bases were located in New York, Halifax and in the West Indies. To complete this lesson, click here to login and take the exam. A score of 70% is required to receive credit on your certificates.